Dr Lee Brooks presented Redecols recent study "A Novel Asthma Monitoring Device Methacholine Challenge Study" at the European Academy of Allergy and Clinical Immunology in Munich this week Demonstrating that Breathe EasyFlow (using EBC1) was able to detect changes in lung function (tracked using FEV1). 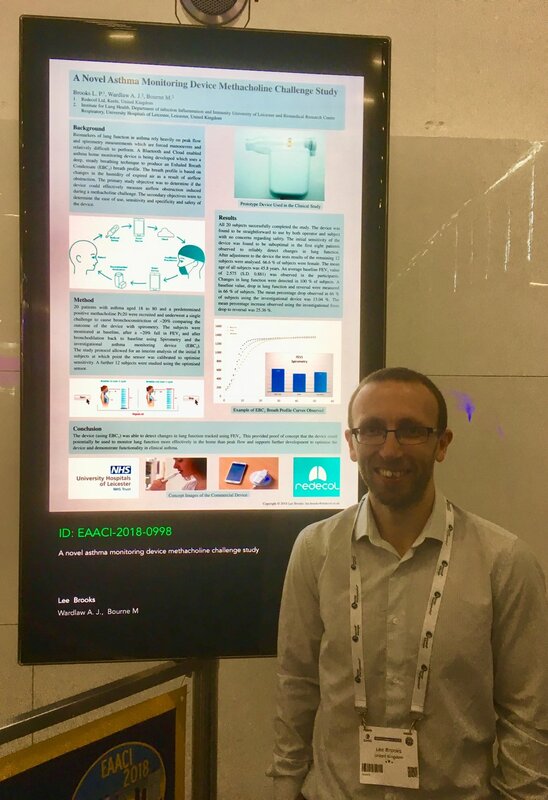 The poster highlights that Breathe EasyFlow could potentially be used to monitor lung function more effectively in the home than peak flow and supports further development to optimise the device and demonstrate functionality in clinical asthma. Lee Brooks commented, "The results achieved in Leicester are very encouraging and support the further development of Breathe EasyFlow for monitoring lung function in the patients home"